Introducing a living wage has topped this blog’s survey of progressive manifesto ideas. The idea beat a green new deal as the most popular manifesto ideas. The introduction of a living wage has topped Left Foot Forward’s survey of progressive manifesto ideas. 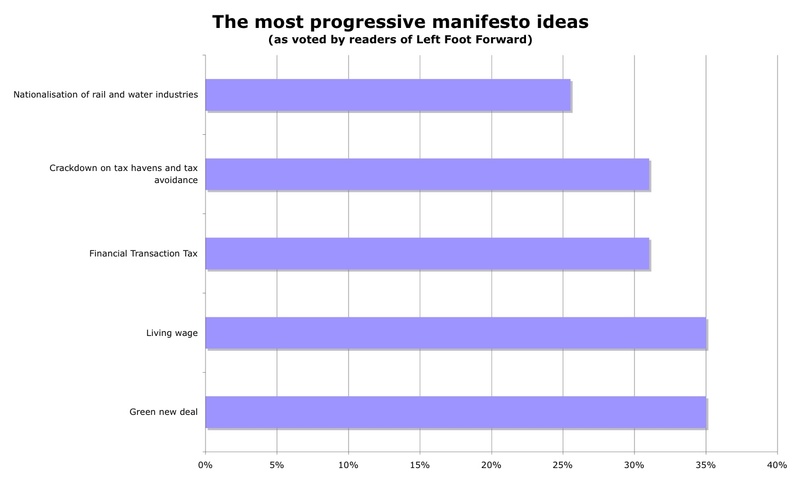 The idea edged a green new deal as the most popular manifesto idea among this blog’s readers. Since September, Left Foot Forward has been publishing manifesto ideas written by our readers. Last month, we commenced an online poll and can now reveal the results. A living wage as campaigned for by London Citizens was chosen by 35 per cent of people who took part in our poll. In recent days, the idea has provoked an interesting debate on Next Left over whether the policy is the “right answer to low pay”. A green new deal, along the lines promoted by the new economics foundation, got fractionally fewer votes and came in second place. Two proposals by Duncan Green of Oxfam received 31 per cent of the vote. They were a financial transaction tax – consistent with the popular Robin Hood campaign – and cracking down on tax havens and tax avoidance, a favourite of campaigning economist Richard Murphy. In fifth place, with 26 per cent, is the nationalisation of the rail and water industries which was suggested by Labour PPC Julian Ware-Lane. Other policies to feature prominently were greater incentives for employee ownership; free school meals for all as piloted by Islington Council and promoted by Labour List; a social responsibility levy on top bonuses; replacing university “top up” fees with a graduate tax; and unilateral nuclear disarmament. Last week, Labour’s manifesto coordinator, Ed Miliband, encouraged activists to submit ideas to the Labour Space website. We will be sending these results to him and to the manifesto coordinators of all progressive parties including the Conservative party who have claimed in recent years to be a party of “progressive conservatives”. The phrase has been criticised, including on this blog, but we will take them at face value and hope they’ll listen to our readers. While our list was never intended to be an exhaustive grouping of manifesto ideas we hope that the results of our survey are useful for any political party pushing for a more progressive Britain. A total of 922 votes were received by the 19 ideas on our list. Progressive Conservatives? Think you’re expecting a bit much, Will. However, I am not in favour of unilateral nuclear disarmament without countries like Iran doing the same.